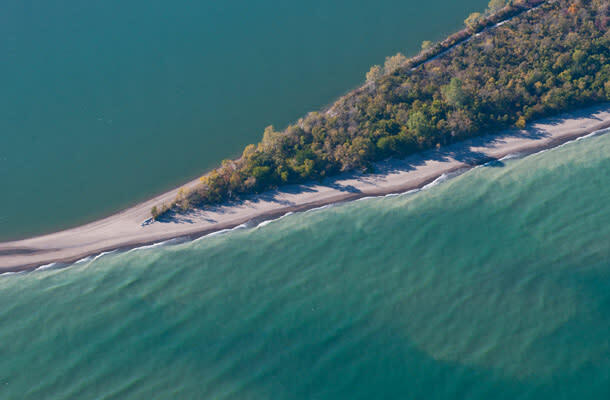 I consider myself to be someone with a passion for travel and adventure so when I heard I was getting the opportunity to tour Pelee Island, the southern-most inhabited point of Canada, I was thrilled. As we were catching the early ferry, my colleague and I decided to head to Leamington the evening before. Greeted with a big smile from the hotel clerk at the Days Inn Leamington after a lengthy drive, we checked into our rooms. Having the pleasure of staying in one of their newly renovated rooms at the inn was a great way to spend the night awaiting the excitement of the day to come. For dinner, we walked across the street from the inn to Armando’s Pizza. The great thing about the restaurant, to go along with great food, is that it had local beer available from Walkerville Brewery in Windsor. We each had a glass of Honest Lager with our meal, which if you haven’t tried craft beer, is a great beginners’ beer for someone like me, who’s wanted to make their way into the fantastic Ontario craft beer scene. After a great nights’ sleep and a quick bite of the complimentary continental breakfast in the morning, we spoke to Justin, the new General Manager at the Days Inn. Justin informed us of the various tourist attractions, what to expect on the ferry as well as on the Island itself. He was a very knowledgeable and passionate person about the area, which only heightened the excitement of my first visit. From the Days Inn to the Leamington Ferry terminal was a quick five minute drive. There are a couple of different Ferries, but the main one that services Pelee Island, and the one we took, was called the Jiimaan. The Jiimaan can hold over 30 vehicles and 400 passengers, has a full cafeteria, gift shop, and observation deck. For your convenience you can walk, drive or even cycle onto the ferry to visit Pelee Island. We arrived early as recommended by ferry reservation staff and waited for “anchors up” at 10am. The Ferry takes roughly 90 minutes to reach Pelee Island, so while on board we enjoyed a second hearty breakfast including two eggs, hash browns, bacon, toast and coffee. Needless to say it hit the spot. For the last remaining minutes of the voyage we made our way up and outside to the observation deck, braving the cloudy, yet surprisingly warm weather, to catch a glimpse as we docked onto the Island. 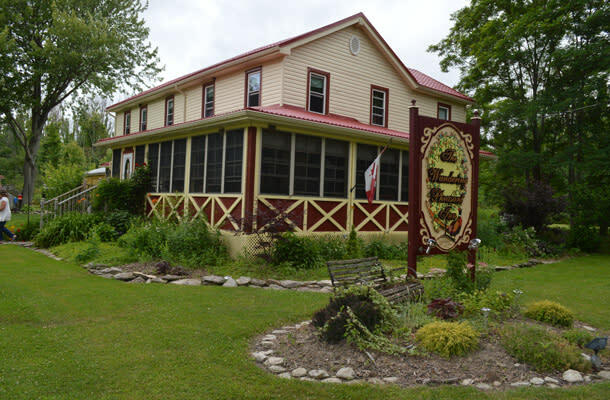 Our first stop on the Island was a charming B&B the Wandering Dog Inn, boasting the title of “Canada’s Most Southern Inn”. When we arrived, I was introduced to Sandra, the owner of the business. She is a very passionate and driven individual, a real delight to be around. She loves her business, knows the history of its past owners, even all the “ghost stories” of the property and has many interesting tales to boot! After giving us a slice of homemade banana bread Sandra took us on a tour of the Inn. Being built in the 1800’s, the house has a lot of charm. Each room has its own unique design and theme, such as the Princess Diana room and the Admiral room. When Sandra took us outside, the first thing she mentioned is that they have a large covered outdoor hot tub for guests to use. Now if that didn’t catch your attention I don’t know what else would. Separate from the main house B&B on the other side of the yard is there is another building, consisting of four suites. Each suite had a screened in porch with a hammock. That’s right, a hammock. Going back to my point about the hot tub, this definitely puts the icing on the cake. We didn’t get a chance to spend a night at the Wandering Pheasant as we were only on the island for the afternoon but I can assure you; when I do get the chance to stay overnight on the Island she will be the first person I contact! Pelee Island is not only home to great local businesses, but also to many natural wonders and manmade roadside attractions. Starting with the manmade attractions, there is a miniature model of the very first winery in Ontario, Vin Villa Winery. The model winery is really neat, just off the side of the road; it is a replica of the first estate winery in Ontario, but it looks more like a mansion to me. The model is beautifully crafted and a great representation of the original building. There are ruins of the original building on the Island that can be toured; we just didn’t get a chance on this visit. Another manmade roadside attraction we saw was the Shoe Tree. Just like when you see shoes tossed on wires in cities, the Shoe Tree is as the name suggests; a tree full of shoes. People from all over, the island and visitors, come to the spot to hang their shoes on the tree. The tree has even loaned a shoe to a runner who broke his during a marathon held on the island. Our last roadside stop was on the east coast of the Island, the Glacial Grooves. I was told that a long time ago glaciers scraped along the side of the island leaving large slate stone deposits. When we stopped, the water level was high and the rock was only visible through the water. However, I would recommend a stop, as later in the summer the water is not always this high and it is a sight you wouldn’t want to miss! 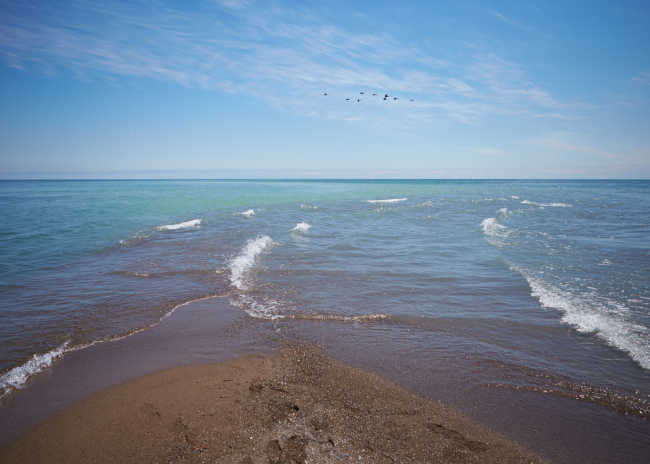 On the southernmost point of Pelee Island sits Fish Point Provincial Nature Reserve. At the very tip, is the most southern point of habited Canada. The park has a beautiful sandy beach, and trails through Carolinian forest. To get to the tip requires a bit of a hike, either along the water’s edge or through trails, that we didn’t have the proper footwear for so I have yet to officially stand on the southernmost point of Canada. However, that just gives me yet another reason to return to the island! Before this trip, I had never been to a winery or even seen a vineyard aside from those in movies. I was not exactly sure what to expect when we visited Pelee Island Winery but was I ever blown away. The Pavilion was by far my favorite part. On the outside stood antique machines used to crush grapes, and massive wine barrels no longer in use. On the inside was a wide open showroom with beautiful displays of wine bottles, antique machinery, a retail store and of course a wine tasting bar. I have never been much of a wine drinker, but I can recommend the Baco Noir Reserve, which is sold exclusively at the Pavilion on Pelee Island and the winery in Kingsville. The Pavilion is also a great spot to eat on the Island as it has its own BBQ pit with numerous BBQs to serve customers. You buy the uncooked food such as burgers, hotdogs, etc. at the kitchen window and take it to an open BBQ (try not to steal someone else’s) to cook it to your liking. Since we were pressed for time, we decided to order one of the many premade options available on the menu; we went for the pulled pork sandwiches and Mediterranean humus with toast points, a delicious option. Early in the season, the ferry returns to the mainland early in the day, so we were cutting it close to get in our last stop at the Pelee Island Heritage Center. Thankfully it was located right across the road from the docks. We popped in and met with Kim, who gave us a brief overview of the Museum before we went in for a quick tour. There are plenty of artifacts showcasing the vast history of Pelee Island including arrow heads and tools from early settlers, historical fishing equipment, stuffed examples of local wildlife and old pianos (which I badly wanted to play, but as per the signs was not permitted to). If you are looking for a great way to experience the history of Pelee Island I highly recommend a visit to the Museum! After the museum, we were the last to get in line to drive onto the Ferry. It was time to say goodbye to our afternoon Pelee Island adventure. Having only been once, I can honestly say that an afternoon is not enough time to experience what is Pelee Island considering there was a lot I didn’t get a chance to explore. This was but a tease of the real experiences and beauty that await me on my next adventure to Canada’s Best Kept Secret.